Insufficient disk space can lead to the frustration of moving data from one place to another, in an attempt to acquire more space. pCloud Drive can provide you with that extra bit of free space you need, so you don't have to start storing important files on discs or other external devices. It is similar to other cloud storage applications, like Dropbox or Google Drive, but it is easier to access and it doesn't need to store the bulk of your data on your hard drive. Whenever you need to free up some disk space or back up an important document, you can store everything in the cloud at a moment's notice. pCloud Drive is available for Windows and Mac OS X, as well as for iOS and Android devices. Versions for Windows XP and Linux are not available yet, but they are on their way. You can use the application with 11 GB of storage space completely free of charge. If you want more space, you have to pay a monthly subscription. 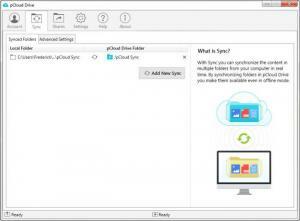 Instead of creating a sync folder, like Dropbox or other similar applications, pCloud Drive creates a virtual drive. It shows up as a new partition in Windows Explorer, once you have the application up and running and you can treat it as such. The operating system will show the same kind of properties for the virtual drive, as if it were a real one and you may create folders and sub-folders and organize your files however you want. It should be fairly obvious that anything you store in the virtual partition is actually stored on the cloud and not on your disk. Besides browsing through the data like on a real partition, you can also log into your online account and access your stored data on a web browser, from anywhere in the world. If you wish to upload a large amount of data to the cloud, without copying or moving anything to the virtual drive, you can open the application's tabbed configurations menu and add new sync folder. Sharing data is another possibility. You can allow other people to access specific folders via email invitations and set up different permissions for reading, writing, modifying or deleting data. Alternatively, you can generate upload and download links if you want to share something faster. The application provides you with a free 11 GB virtual partition. You can upload and back up data just by storing files in the virtual partition. pCloud Drive is free and there are many ways to get more free space. Using pCloud Drive is just like having an additional hard drive installed into your computer, but without connecting any wires.